Czech beer is simply wonderful - many afficionados consider it the best beer in the world. You can be the judge when you taste it, but in my view, it is simply delicious and incredibly drinkable (maybe too drinkable!). Czech beers come in many varieties and brands, and they are all unique and very good. Some of the brands go back centuries, and the famous "Pilsner Urquell" (where the word "pilsner" comes from) has long been considered by many to be the best Czech beer, with Budweiser (yes, the original Bud) following at a close second. But now the microbrewery craze has hit the Czech Republic, too, and as with all things beer, the Czechs take their microbrewing very seriously, too. This page features some of the best Czech brands to sample, as well as some of the best places to try them. See my Prague guidebook for more. Pilsner Urquell - Considered the "king of beers" here, this is by far the most popular brand in the country. It has also long been considered the best Czech beer. Though the new microbrews have started to make this beer seem staid, Pilsner Urquell (Plzensky Prazdroj in Czech) would not be outdone. They've begun shipping "tank" beer to many local restaurants. Fresh, unfiltered and unpasteurized, "tank" beer goes straight from brewery to tank to pub in a matter of hours and must be consumed within two weeks (which is not a problem here). Though I love many other brands, this one is still my favorite. 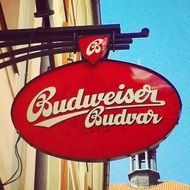 Budweiser (Budvar) - The Budwieser you drink in the US originated here in the Czech Republic in the town of Cesky Budejovice (Budweis in German). It, along with Pilsner Urquell, was long considered one of the best Czech beers (and, no, it tastes nothing like the American Bud - it's much better). It has a very distinctive, almost sweet flavor, and is ideal with Czech roast duck. Unfortunately, this beer is hard to find outside of the region where it's brewed, due to the fact that the company is in trademark disputes with the American company and so remains state-owned. But if you look out for the logo (and grab one when you find it), you can find a few spots in Prague. Gambrinus - This lighter, cheaper beer plays second fiddle to Pilsner Uquell when it comes to lagers. It's very drinkable, so give it a try. Matuska, Policske, Cerna Hora, and Uneticky are all making waves on the microbrew scene. Seeking out pubs in Prague that pour these brands (and that pour them well) has become a kind of obsessive pastime for locals and visitors alike. You might have to get out into the 'burbs to find them, but it might be worth the effort! U Zlateho Tigra - this is one of the few traditional pubs still left in the center of Prague, and one of the oldest. Bill Clinton downed a few Urquells here when he was president. Lokal - this eatery (two locations) features ultra-fresh, unfiltered, unpasteurized Pilsner Urquell in it's tanks. The price is right, too.